"I remember him as John Torres friend, May you always Walk in Beauty "
"To one of the most honorable men I have ever known, you will be greatly missed. It was an honor to work for and with you!" "I was shocked to hear of Joe's passing. I am so sorry for your loss. He always had a smile and a hello. We will miss him! You all are in..."
"Rest in Eternal Peace. Prayers for all the family’s sorrow to be eased, knowing he is at rest. 🙏🏻🕊"
"I am so sorry for your loss. Joe always had a smile on his face and will be missed by many. " "Thinking of you, wishing you hope in the midst of sorrow, comfort in the midst of pain. Thoughts and prayers to you and your family." "We are so sorry for the loss of one of the most genuine people we have ever had the honor of knowing. 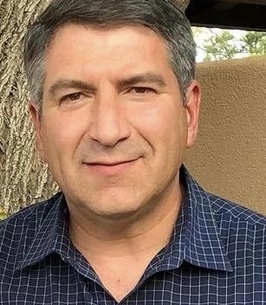 We had the chance to have a conversation..."
Joseph Baca, age 52, a resident of Belen, went to heaven on Wednesday, October 31, 2018. He was born October 23, 1966 in Socorro, NM to Patrick Baca and Margaret Perea Baca. At birth, he weighed 10 lbs 4 oz, the biggest baby born at the hospital at the time. He grew up on a farm in Belen and drove his first truck at 5 years old. He would "repair" his sister's radio and removed all the springs from the ball point pens. Joe retired from the United States Air Force, having proudly served his country for 20 years. After retiring, he worked for the USDA Forest Service, but his greatest joy in life was his family. He was loved by everyone who knew him and we take great comfort in knowing that Joseph followed Jesus and he has now met Him face to face. Joseph is survived by his wife of 25 years, Carolyn J. Baca; son, David and daughter, Caitlin. He is also survived by his mother, Margaret Baca; brothers, Adrian Baca (Rose), Martin (Carolyn), Gilbert (Charlene) and sisters, Anna Baca and Barbara Snow (Nathan), as well as many nieces, nephews and cousins. He was preceded in death by his father, Patrick Baca, Sr.; brother, Patrick Baca, Jr. and his great nephew, Mateo David. Trust in the Lord with all your heart and lean not on your own understanding. In all your ways acknowledge Him, and He shall direct your steps. Proverbs 3:5-6. All services will be held at Our Lady of Belen Catholic Church on Monday, November 5, 2018, beginning with a viewing at 12:00 PM, followed by a rosary at 12:30 PM and the funeral Mass at 1:00 PM. Interment with military honors will follow at Our Lady of Belen Memorial Gardens. Arrangements are being handled by the caring professionals at the Noblin Funeral Service Belen Chapel, 418 W. Reinken Ave., (505)864-4448. To send flowers to the family of Joseph L. Baca, please visit our Heartfelt Sympathies Store. I know this is quite late. I went through Allstate training with Joe. Joe was a friend. He was kind, funny, always happy, and a great fellow agent. Recently I was thinking about Joe and wondering what he was up to, which is what made me look him up. I was very saddened to learn of Joe's passing. My heart is heavy for his family and for the loss anyone who knew Joe feels. He was one of this world's greatest men and a great friend to all. He will be missed. May you continue to feel him watching over you and his love. His family was the most important thing to him and I know he won't ever be too far away from them. To my life long friend you will be missed but I will always remember your big smile, laughs and friendship. To one of the most honorable men I have ever known, you will be greatly missed. It was an honor to work for and with you! Carolyn and family. My deepest condolences to you all on your loss. I knew Joe when he was stationed in Colorado Springs. He had such a kind spirit and I know you all will miss him deeply. May God give you strength and wrap his loving arms around you as you go through these extremely tough times. I will keep you all in my prayers! God bless you all. I was shocked to hear of Joe's passing. I am so sorry for your loss. He always had a smile and a hello. We will miss him! You all are in my thoughts and prayers. To the family of Joseph Baca, We are truly sorry for your loss. We are thinking about you all, and we pray that the good Lord will give you all the courage and the hope to get through this difficult time. Joseph was such a kind and friendly fellow, and we all @ Pete's Café miss his sweet smile. God Bless You all.